On my way into work this morning I caught a great interview on Sirius XM Doctor Radio discussing the very important topic of diabetes. The doctors on the show were answering questions from people calling in with their own health concerns related to diabetes. Since November is National Diabetes Awareness Month, I thought it would be good to discuss this far-reaching topic. Diabetes is a world-wide concern that is growing both in incidence and prevalence. In 2014, the CDC estimated that diabetes affects 29 million people in the United States (that’s almost 10%!). It’s safe to say that these numbers have only increased in the last few years. One person called in with a strong family history of diabetes and a BMI of 33 (obese). She had recent lab work and wanted to know if her levels indicated insulin resistance. She reported that her HbA1C (average blood-sugar balance over 3 months) was 5.3%, fasting glucose 92 and fasting insulin of 8. The doctor on the radio commented that, based on the HbA1C and glucose, her levels would not fall into the insulin-resistant category. This is true; however, the doctor on the show didn’t discuss one very important piece of the caller’s lab results. Her fasting insulin of 8 indicates a trend toward insulin resistance. Insulin plays the very important role of helping us to take up glucose and nutrients into the cell to be utilized for fuel. If we have been fasting overnight, there should be very little need for insulin. Ideally, insulin levels should be much closer to zero (4 or lower is best) when someone has been fasting 8-12 hours. Insulin resistance is the precursor to type 2 diabetes. Our cells become resistant to insulin when we have repeated spikes of blood sugar followed by an increase in insulin. This is why it’s important to avoid sugar and processed foods that cause a rapid increase in blood sugar. Another caller reported that his type 2 diabetes had been controlled with medications and a consistent HbA1C of 7.4%. (To give you a frame of reference, mounting evidence indicates that non-diabetic individuals with a HbA1C between 5.5-6.0% have a significantly greater incidence of stroke and cardiovascular disease than those who maintain numbers between 5.0-5.5%. A HbA1C over 6.5% is considered diagnostic for diabetes.) At one point the caller was put on a statin drug to reduce his LDL, which had been in the 140’s. The statin medication brought his LDL down to the low 50’s and he then developed severe diabetic neuropathy. (Neuropathy is the medical term for a kind of nerve damage which causes pain, tingling, “pins and needles,” numbness or burning sensations in the hands or feet.) He wanted to know if the statin had caused his neuropathy. The doctor on the radio rightfully responded that additional information would be needed and that a discussion with his doctor was warranted. To further discuss his question, cholesterol is an important building block for many things in the body including the myelin sheath that covers and protects our nerves. An LDL cholesterol in the 50’s is quite low and very likely contributed to his diabetic neuropathy. Statin drugs are also known to raise blood sugar and deplete the body of an important antioxidant called CoQ10. An increase in blood sugar along with a decrease in cellular protection from lack of CoQ10 may also have contributed to his severe neuropathy. Type 2 diabetes is a serious health concern with many contributing factors: genetics, diet, lifestyle, nutrient deficiencies, environmental toxins and immune dysregulation. Addressing these factors should be the first line of defense for reducing the incidence of diabetes. It’s very important to know that your genetics are not your destiny. By optimizing diet, lifestyle and environmental factors, we can often overcome these genetic tendencies. If Diabetes Is So Complex, Where Do You Start? Sleep is important for hormone signaling and blood sugar balance. Avoid sugar and processed food. Staying active is important for insulin sensitivity. Eat a variety of bright colors that include vegetables and fruit. Eat organic, grass-fed, pastured and wild-caught foods to avoid toxins. Eat healthy fats such as olive oil, coconut oil and grass-fed butter while avoiding refined vegetable oils such as corn, canola, soybean, sunflower and safflower. Optimize the nutrients that are important for blood-sugar balance: vitamin D, magnesium, zinc and chromium. Test all of the important blood sugar markers including fasting insulin. Have testing to check your vitamin D levels and other nutrients. If you have diabetes or insulin resistance, check your blood sugar regularly. Talk with your doctor about the risks and benefits of all medications. 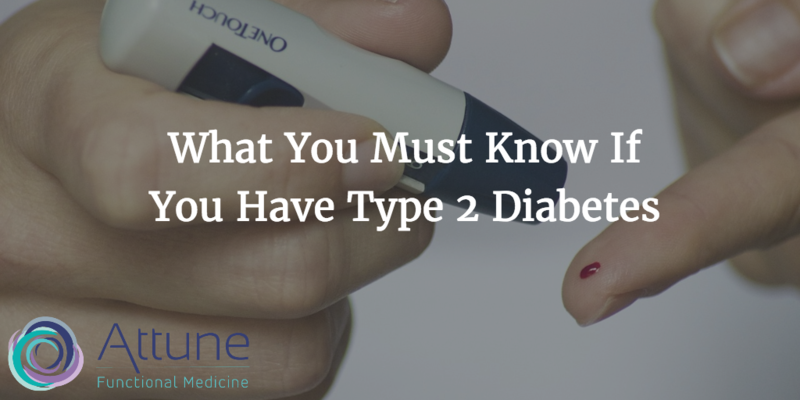 Now I want to hear from you: are you prediabetic or dealing with type 2 diabetes?